Reid's, Argyle Street premises. 1930s. There's been licensed premises on this site since 1837 owned by John Gibson, he ran this popular hostelry for nearly ten years. John Crawford took over in 1855 and traded as a restaurateur and wine and spirit merchant until the late 1880s. John McGuffie a Glaswegian took over in 1894, the pub was known then as the Roderick Dhu. John after leaving school work in a coalmaster's office and stayed with the same firm for a considerable time, he always had the ambition to work in the licensed trade and left to join the staff of J & J Steele, firstly as a barman then worked his way up to management. 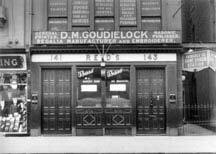 Mr McGuffie left this firm to work with Thomas Reid as manager of his public house on North Street. John remained with Mr Reid for nine years then took over the Roderick Dhu as his own boss. The Roderick Dhu had a good reputation for good quality liquor and snacks, the pub had two large etched windows. On the right as you entered the premises were two rooms with expensive stained glass while at the back of the premises was a large and spacious sitting room which could be used for smoking concerts, presentations, club meetings and society meetings. Snacks were served between specified hours. John McGuffie was an enthusiastic Free manson of Lodge Kilwinning, no.4, he lived out in Springhill Terr, Clarkston and took over another public house in nearby Main Street, Busby, in 1907. Thomas Reid, his old boss took over the Roderick Dhu in 1909 renaming the pub Reid's. It's possible that Thomas Reid financed Mr McGuffie for the premises. Reid's closed down around 1929. Also see Reid's other premises.